What Happened to the Fort Worth Trio? Inside the haunting disappearance of Rachel Trlica, Renee Wilson, and Julie Ann Moseley. Fort Worth, Texas. The year was 1974. It was two days before Christmas. Gerald Ford was president and Kung Fu Fighting was the nation’s number one song. Three girls were driving down Gordon Avenue in a brown Oldsmobile 98. Maybe they listened to Kung Fu Fighting on the radio. Maybe they found a station playing Christmas music instead. Whatever they played, if they played anything at all, I hope they sang along. I hope they sang loudly, with their shoulders back and their mouths, wide. I like to think they were happy that day. Because no one ever saw them again. Their names were Mary “Rachel” Arnold Trlica, Lisa “Renee” Wilson and Julie Ann Moseley. Rachel, seventeen, was the oldest. She was 5’ 6” with sleepy green eyes that made her look like a movie star. She was married, which wasn’t nearly as unusual in 1974 as it would be today. Rachel’s husband was Thomas Trlica but she affectionately called him Tommy. He was a handsome twenty-one-year-old, already divorced with a two-year-old child. Before he married Rachel he’d been engaged to her sister, Debra. Debra was two years older than Rachel and just as pretty. Years later she would roll her eyes and tell a reporter her engagement to Tommy wasn’t a real engagement. She’s consistently said there was no animosity or jealousy between herself and Rachel over Tommy. By all appearances this was true. Shortly before she went missing, Rachel even invited her sister to move in with the couple when Debra split up with her boyfriend. She was still living with them the day Rachel disappeared. On December 23rd, 1974 Rachel decided to go Christmas shopping at the Seminary South Shopping Center. She asked Debra to come along, but she was tired and wanted to sleep in. This left Rachel to set off by herself to pick up fourteen-year-old Renee, who was spending the weekend at her grandparents’ house on Gordon Avenue. Their families were close friends and the two girls had known each other their whole lives. Renee was was 5’2” and her brown eyes had a touch of mischief in them. That morning she was with her boyfriend, fifteen-year-old Terry Moseley, who lived across the street. He’d woken her up to surprise her with a promise ring. When Rachel called to invite her shopping, Renee accepted, but only on the condition they’d return no later than 4 pm. She and Terry were attending a Christmas party that night and she wanted to make sure she had time to fix herself up beforehand. It would be her first party wearing her new promise ring and she wanted to look her best. Terry’s younger sisters, Janet, eleven, and Julie, nine, were also hanging around that morning. It was that kind of neighborhood. The kids were constantly popping in and out of each other’s houses. Rachel and Renee asked Janet to join them at the mall but she chose to stay behind with a friend. Julie saw her opening and asked if she might come along. Terry says the two older girls weren’t keen on the idea of spending the afternoon looking after a nine-year-old, so they attempted to outsmart the situation by telling her she could only go if she got permission from her mother. They were certain she’d say no. She always did. Julie was a tiny wisp of a thing, 4’3”with twinkling blue eyes. She excitedly called her mother, Rayanne, at work and asked for permission to tag along with the two older girls. Rayanne said, no. Julie didn’t have any money, and besides that, although she knew Renee quite well, she didn’t know Rachel. But Julie begged to go, pleading that otherwise, she’d have no one to play with. Her mother eventually acquiesced. It was a decision she’d regret for the rest of her life. The girls also invited Terry, but he’d already promised to spend the day with a friend scheduled for hernia surgery the following day. A decision he, too, would always regret. Shortly before noon, Rachel, Renee, and Julie clambered into the Oldsmobile. It was a sturdy car, long and wide. It’s easy to imagine their parents believed their daughters would be safe inside such a vehicle. No one imagined danger could be lurking somewhere outside. Their first stop was the Army Navy Store to pick up a pair of jeans Renee had on layaway, probably the hip-hugging bell bottoms she was so fond of. They made it safely and headed down to the Seminary South Shopping Center. Later, several shoppers reported seeing them there. Renee, in particular, stood out because of her t-shirt. It was a pale yellow-green with the words “Sweet Honesty” printed across the front. While the girls were shopping, their families went on with their lives. Parents went to work. Younger brothers tied their shoes and went outside to play. It was a normal day in Fort Worth, Texas. No one had any idea from that point forward their lives would never be the same. If Renee hadn’t been so excited about attending that Christmas party with Terry it might have taken longer for people to realize something was wrong. But she’d been emphatic about getting home by four and people took notice when the girls didn’t make the deadline. Julie’s mother also told her to be back by four and was upset she didn’t follow through. Rachel’s family worried that perhaps her car had experienced a breakdown. There were no cell phones back then, so they drove to the mall, searching for signs of the car alongside the road. When they didn’t find it, they wove through the parking lot of the Seminary South Shopping Center, hunting for a brown Oldsmobile 98 amidst a sea of cars on one of the busiest shopping days of the year. Around 6 pm they spotted it, parked in the upper lot of Sears. The doors were locked and a single, wrapped Christmas gift lay on the floor of the back seat. This was said to be a gift Renee brought along for Rachel’s two-year-old stepson, Shawn. The girls, themselves, were nowhere to be seen. Rachel’s little brother, Rusty Arnold, was eleven years old when the girls disappeared. Now in his mid-fifties, he’s recounted numerous times throughout the years about how he remembers following his mother, Fran, into the mall to search for his big sister and her two friends. People were swarming everywhere. Finding three girls amidst the throng would be nearly impossible. But Fran was a resourceful woman who wasn’t about to rely on a chance sighting. She brought young Rusty into each and every store and asked the managers to page the girls. No one answered. Fran wasn’t the only person who couldn’t shake the feeling something wasn’t right. Renee’s father, Richard, and a neighbor climbed onto the roof of a nearby building that night to stand watch over the car. The men pointed loaded shotguns at the abandoned Oldsmobile. They weren’t sure what to expect, but they were damn sure going to be ready for it. The families called each one of the girl’s friends asking if they’d seen or heard anything. No one had. They called the hospitals, and of course, the police. The Fort Worth police and the families part ways on what happened next. The families contend that law enforcement didn’t take the disappearance seriously at first and assumed the girls were runaways. It was a preposterous notion in their view. Why would they have invited the likes of Terry, Janet, and Debra to join them if they’d planned to run away? Also, why bring a nine-year-old? None of them took any spare clothes or personal belongings, they had very little money, and they’d left the car behind. It didn’t pass the smell test. The police department respectfully disagrees with the families’ view of how they handled the case and claims they investigated rigorously from the outset. Four months later, an article in the Cuero Daily Record also reports the police originally thought the girls were runaways. These contemporaneous accounts, along with numerous others, seem to at least partially corroborate the families’ recollection of events. If the families are correct, and the police didn’t take the case seriously in the beginning, one might speculate it was because of the letter. The next day was Christmas Eve. Houses were strung with lights and colorfully wrapped gifts waited underneath brightly decorated trees. It was a festive time, but the girls’ families were in no mood to celebrate. Terry Mosley, who had both a sister and a girlfriend missing, says he didn’t eat or sleep and gave his presents away. 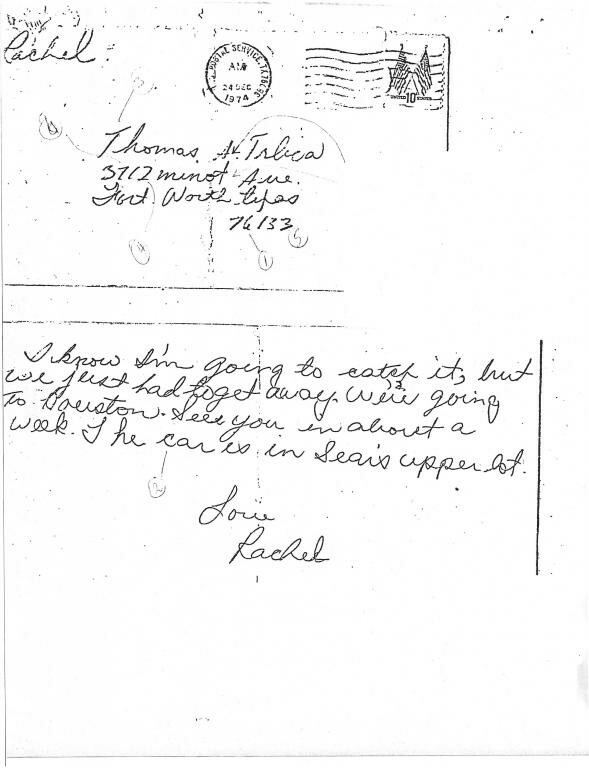 Six days after the letter arrived, the police told the Fort Worth Star-Telegram they verified that the handwriting belonged to Rachel but also admitted she could have been forced to write it. However, In 1978, Fort Worth police detective George Hudson refuted this, stating they sent “stacks of things” Rachel had written to the FBI for analysis and the results were inconclusive. The true author of the letter remains a mystery. There was also a great deal of debate regarding the postmark. Many people believed the letter could not possibly have been stamped and delivered on the same day, but in 2001 the police verified the postmark was valid and that the letter was sent that morning from Fort Worth. Whoever sent the letter, the contents were tragically, incorrect. The girls didn’t return in about a week. They were never seen again. The girls disappeared in an era when DNA testing didn’t exist. By the time it was developed it was too late to test the car. The letter was eventually tested but didn’t match the girls or anyone else in the database. This means that for the most part, the investigation into the disappearance of Rachel Trlica, Renee Wilson, and Julie Moseley has relied on good old gumshoe work performed by law enforcement, private detectives, family members, and even the occasional psychic. At the time of the disappearance, several people contacted the Fort Worth police to report sightings of the three girls at the Seminary South Shopping Center. Most didn’t relay seeing anything out of the ordinary. Others, however, did claim they saw something unusual. Authorities interviewed a night watchman who worked down the road from the Seminary South Shopping Center at Alcon Laboratories. He reported seeing a car containing two men and three girls pulling into the driveway the night the girls vanished. The lead was a dead end. They also checked with a ticket agent at the bus station who claimed three girls asked about fares to Houston and other destinations the morning after the disappearance. The police said they weren’t sure the information was reliable. In the early spring of 1975, the three families, frustrated with the lack of progress in the investigation, hired Joe Swaim, a flamboyant private investigator. Mr. Swaim had a big personality and a flair for publicity. He held regular press conferences in order to put pressure on the Fort Worth Police Department. He even succeeded in getting them to share a copy of the case files with him. He tracked leads and claimed to receive tips from unidentified informants regarding the location of the girls’ bodies. The police conducted multiple searches based on Mr. Swaim’s anonymous sources of information. None of them panned out. In the meantime, the authorities grew so desperate for leads they chased down tips from psychics who claimed to have divined the location of the girls’ bodies. At one point they dug near an oil well to look for remains after receiving a call from a seer in Hawaii. Once more, they came up empty. The article also cites one lead the police department wasn’t able to track down. In 1975 the Vernon Daily Record reported that an unidentified elderly woman told three store clerks she’d witnessed a man forcing a girl inside a pickup truck on the day of the disappearance. She also said there were two other girls and a man already inside. She didn’t report this sighting to law enforcement, however, despite numerous appeals for her to come forward. They were never able to find her. Private Detective Joe Swaim died of a drug overdose in 1979, subsequently ruled a suicide. For an unknown reason, he requested that all of his case files be destroyed upon his death. If Mr. Swaim did uncover any useful evidence in the case, he took it with him. Seven years later a new witness came forward, claiming he’d been in the Seminary South parking lot on December 23rd, 1974 and witnessed a man shoving three girls into a van. He told authorities he’d confronted the man who told him it was a family matter. They were never able to corroborate his account. Throughout the years, the remains of unidentified women, referred to as Jane Does, were recovered in Texas and the surrounding areas. They probably held the keys to someone else’s sad story, but none of them was a match for this one. The case was a long, frustrating, heartbreaking dead end for all involved. Eventually, it was closed. Family members did their best to get on with the unfathomable process of moving forward with their lives. But never did they give up their search for answers. In 2001 the case was reopened. There’d been tremendous advances in technology since 1974 and the families were hopeful they might finally learn what happened to their daughters. The Fort Worth Police Department held a press conference to announce they’d spoken to at least twenty new witnesses who reported sightings of the girls at the mall and narrowed down a list of possible suspects to under five. Police Detective Tom Boetcher said, “We can say that they were at one point seen with one individual, but we believe there was more than one involved.” Boetcher also said they felt the girls left with someone they trusted. If they didn’t suspect foul play in 1974, the department seemed to have no doubt about it after thirty years had passed. Amongst the new leads, the police were investigating a sighting called in by a former police officer named Bill Hutchins who was working for Sears as a security guard the night the girls disappeared. Mr. Hutchins was working the late shift and claimed he had an unusual encounter with another security guard in a pickup truck around 11:30 pm. Apparently, he and the other security guard exchanged harsh words for an unspecified reason. Mr. Hutchins claimed he approached the vehicle and saw three girls inside. He was very specific about the seating arrangement, stating they were all in the front seat. According to Mr. Hutchins, the youngest girl was sitting next to the driver, an older girl was in the middle, and the oldest and largest was at the end next to the door. He described them as smiling and laughing and appearing to be there of their own free will. According to Mr. Hutchins, he apologized for the language he’d used during the confrontation and they drove away. Unfortunately, the 2001 investigation came up as empty as the others. The case is still open. The thing about tragedies is the way they have of spreading out and growing wider until they’ve swallowed everything in their wake. This case was no different. The first casualty was Rachel’s father, Cotton. He was already a very sick man the night his daughter disappeared. Six months later the cancer took him. He never learned what happened to her. This left his wife, Fran, and her remaining children, Rusty and Debra, alone to navigate a bewildering new world that didn’t include a husband, father or sister. Life somehow went on around them. School remained in session. Bills still needed to be paid. They went through the motions. Fran found a part-time job but struggled to make ends meet once her husband passed away. In time, she remarried. Rusty and Debra, for their part, banded together. They stayed up all hours of the night, poring over newspaper clippings, desperately trying to piece together the mystery. 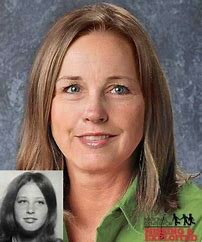 Rusty Arnold grew up with his big sister Rachel’s disappearance as much a part of him as the air he breathed and the house he lived in. As a child, he believed she was alive, waiting for someone to find her and bring her home. It would be a heavy burden for anyone, let alone a young boy. In the late 1990s, Rusty, who was now an adult who’d never given up the belief he would find his sister alive, contacted a private investigator named Dan James after seeing his ad in the yellow pages. It turned out Mr. James was familiar with the case and had been following it since 1975. He had a few theories, in fact. He offered his services to Rusty gratis. Publicly, the private detective even boasted he would offer a twenty-five thousand dollar reward for information (although he never went as far as to establish a dedicated fund and the offer has since been rescinded). Mr. James investigated the case for years. It was a dangerous business, apparently. He told a news outlet he’d received death threats and warnings to walk away but persisted nevertheless. He chased down every rumor, lead and conspiracy theory he could get his hands and ears on. Rusty, for his part, told the reporter that, “Someone close to one of the girls had something to do with the disappearance.” Although he didn’t volunteer who he suspected that person was, a letter published in the paper days later made his suspicions clear. It called upon his sister Debra to take a polygraph test. It was signed by Rusty, Julie’s mother, Rayanne Mosley, and Renee’s parents, Richard and Judy Wilson. Rachel’s mother Fran’s signature was notably absent, which wasn’t surprising considering she’d recently told the Fort Worth Star-Telegram that she blamed Dan James for destroying her family and “poisoning Rusty’s mind.” Mother and son didn’t speak for years. In 2009, Debra posted in a forum called Websleuths and said she had in fact undertaken and passed two polygraph tests, including one with the FBI. She denied any knowledge or involvement in the disappearance. She further went on to blame Rusty’s confusion on years of substance abuse. She also acknowledged that she herself had engaged in similar behavior as she tried to move past the trauma of losing her sister. Over the years Rusty seems to have come around to believing that the girls are most likely dead. He’s also mended his relationship with his mother. In an interview videotaped in December 2017 by the Fort Worth Star-Telegram, he sits side by side with Fran, appearing a little embarrassed when asked about his former theories. He describes what he once believed was a credible sighting of Rachel in a red Corvette as if by way of explanation. These days Rusty maintains a Facebook group devoted to the Fort Worth Trio and participates in discussions related to the disappearance on a regular basis (Julie’s siblings Terry and Janet also post there from time to time). When threads pop up repeating old suspicions of Debra, Rusty, for the most part, stays out of the discussion. Tommy Trlica, for his part, was initially confident the girls would be found within the first days of the disappearance. He put up a $2,000 reward and waited for his young wife to come home. After about a year he moved on, at least in the physical sense. He left Fort Worth, remarried, and went on to become a supervisor at a Texas water company. He’s lived a quiet life, which is perhaps the best thing a person could ask for under the circumstances. Richard and Judy Wilson still had Renee’s younger brother, Ricky, to care for after their daughter went missing. They vowed to give him the most normal life they could under the most abnormal of circumstances. They kept busy and told themselves Renee was dead. It was an agonizing thought, but preferable to the alternative. They couldn’t bear to imagine the girls were being tortured for so many years. Despite moving on with their lives, the Wilsons never gave up searching for Renee. Richard, in particular, undertook numerous searches of the surrounding area and knocked on doors in pursuit of answers. Unfortunately, Judy passed away in 2015 without the closure she desired. Richard continues to search for their daughter. Rayanne Moseley was already going through a difficult time when her daughter Julie disappeared. She and her husband were separated and money was tight. When Julie disappeared she didn’t know where to hang her overwhelming grief, let alone how to take care of her two remaining children. She lost one job, then another. She went out at night. Her son Terry hid food in his closet to make sure he had enough to eat. Her daughter Janet started selling beer and cigarettes at twelve. They grew up fast. Rayanne had multiple breakdowns. She began screaming every time the phone rang because she was certain it would bring more bad news. She was cruelly harassed by pranksters. 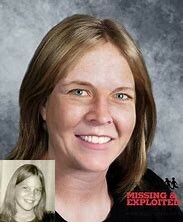 At one point, decades after the disappearance, a woman called and was so convincing in her claims that she was Julie, Rayanne met with her. She was devastated when a DNA test proved the woman was lying. Rayanne’s only wish was to live long enough to find out what happened to her daughter. It wasn’t realized. She died in 2013 without the closure she so longed for. Terry is sixty now. He’s had to accept the fact that once he was a fifteen-year-old boy who told three girls he didn’t want to go shopping. Just like Rayanne had to accept that she gave her daughter permission to tag along and Debra’s had to accept that she preferred to stay home and sleep in. There are a thousand things that might have transpired differently that day but none of them matter because they don’t change what happened. Three girls went to the mall and didn’t come back. And more than forty years later, three families are still trying to find them. Until that time comes, I like to imagine three young girls are listening to Kung Fu Fighting or Christmas music as they cruise down Gordon Avenue in a big, brown Oldsmobile. They’re singing along with their shoulders back and their mouths, wide. Forever happy, and frozen in time. Correction: An earlier version of this article stated that Rachel’s father, Cotton, was standing watch with Renee’s father, Richard, on the roof of the Firestone the night of the disappearance. The article has since been updated to reflect the fact that Cotton wasn’t there. He was too ill at the time. 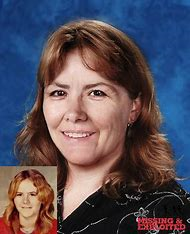 The story also originally stated the jeans Renee picked up from layaway were not in the car when it was found, but the author has since learned they were in the trunk and edited the article to reflect that. Can’t sleep? Read non-fiction tales that will fill you with fear and existential dread. True crime, fangs and wings, the unsolved and unexplained, conspiracy theories, and real lore — all in one publication.